Hey, there, gang. Robbie Jordan here, from Maddie Day's Country Store Mysteries. It's summertime! And we got through the recent unpleasantness of not one but two murders in the area last month. 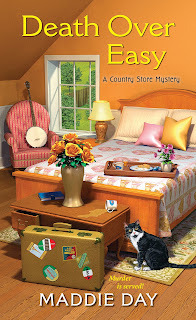 The tale is told in Death Over Easy, and my author says she has one last advance copy for one commenter here today! So I thought I'd share what July is like in my neck of the woods, specifically Brown County, Indiana. Average high temperature is 85 degrees Fahrenheit, with an average low of 64 - so crank up that AC - and we usually get about 8 days of rain. Here are some activity highlights from BrownCounty.com. The Beanblossom Southern Gospel Jubilee. This takes place at the Bill Monroe Music Park - the same place where some of the action in Death Over Easy happens! For a different style of music, check out the Indiana State Fingerstyle Guitar Festival in the county seat of Nashville. Try the Village Art Walk in Nashville on the fourth Friday, where art galleries stay open late and offer refreshments, music, and programs. All month the trails are open at Brown County State Park. You can also swim and boat on Lake Lemon and ride your bike up and down the scenic hills like I do. In addition, of course, tomorrow is Independence Day! Catch the fireworks at dusk at the Brown County High School football field. But first come on down to Pans 'N Pancakes for lunch. Yes, we'll be open, and I'll be serving my special flag cheesecakes! Readers: What's your favorite 4th of July treat? Do you celebrate with a cookout and watching fireworks, or prefer to stay cool and read indoors? Remember, my author is giving away the last ARC of Death Over Easy, so be sure to include your email address! I would say steak on the grill and fresh corn on the cob. Favorite treat is grilled hotdogs. I can't think of July 4th without thinking about what it meant growing up - grilled cheeseburgers, iced down watermelon right off the vine and for our special treat it was always homemade ice cream. As a kid it was a thrill to be chosen to sit on the blanket on top of the churn while Dad cranked the handle knowing that soon what delicious treat we would be eating after it was cranked and "cured" packed in ice. I think it was made extra special by the fresh picked strawberries or peaches that Mom add to the homemade ice cream mixture that made it even better than any store bought with toppings you could buy. Even though it's just hubby and I now, we still try to always have homemade ice cream on the 4th. It's still delicious but it's not quite as good as that from years gone by. Maybe it's the fact that you plug it in now instead of cranking or the fact that the fruit was bought at the farmer's market instead of picked by loving hands or maybe it's just that all the loved ones gone before us aren't here to feast upon it with us. All I know, is that we smack our lips both with delicious just made ice cream and smile from all the wonderful memories it invokes. Can't wait for the opportunity to read "Death Over Easy". I prefer to stay inside and relax. kvmatlock (at) gmail (dot) com. My favorite 4th of July treat is anything grilled! We have been under level 2 fire restrictions all summer because of lack of rain. Unfortunately it also means no fireworks this year -- at least our dogs will be happy. I am sure I will cringe if I hear any kind of firework go off, because it is really, really dry here and the fire danger is very real. bobandcelia@sbcglobal.net Happy 4th to everyone! This year, I am staying indoors! It is too humid out! I will be having chicken, potato salad, veggies and dip and strawberry shortcake. I love this frozen strawberry margarita cheesecake I make. It's been so hot this year, I plan to stay home in the A/C and read. I work early this year, so we will stay home and grill! Oh and for the 4th, I will be trying to keep my dog calm!! As long as we grill something I'm happy. It's been a long time since I've visited that area of Indiana. We lived in West Lafayette before moving to Minnesota. I remember going down to the levee to listen to the Lafayette Orchestra and watching fireworks over the Wabash. Thanks for the chance. We used to look forward to fireworks, especially my husband, but we now have a sweet coonhound who is terrified of the noise. So now we do things to sooth the big guy and try to snag a funbel cake during celebrations. Eileen A-W is our lucky winner - please check your email! And congratulations. I wish I had a book for everyone. Congrats to Eileen. I was hoping to comment before the deadline. Missed it however. Happy release Edith.